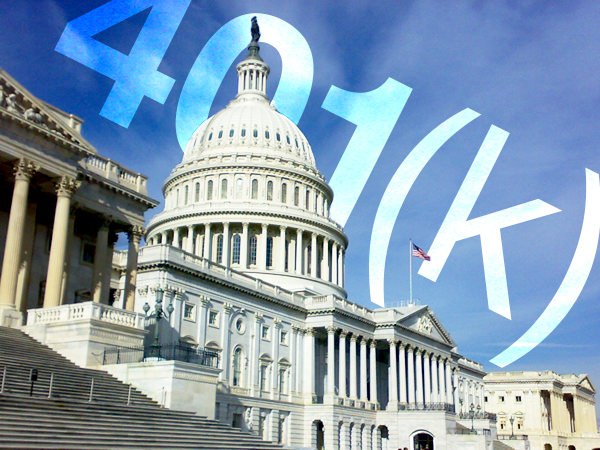 Federal legislators are on the hunt for new revenue to offset their planned tax cuts, and some recent reports indicate that they might ransack 401(k) benefits to get it. If Congress gets its way, some employer-sponsored tax-advantaged retirement accounts could be in for a serious haircut. Let’s take a look at what some in Congress are proposing, why their plans are such an affront to the American people, and what options you may have to keep them from touching your retirement dollars. About 54% of Americans hold a retirement plan through their employer, most often a 401(k). And the Federal government has given workers an incentive to encourage them to save through those accounts: a tax deduction every year on whatever folks put in. The only time the money inside the account is taxed is when it gets withdrawn. When that happens during retirement, the withdrawals are normally treated as standard income, and even the gains accumulated in the account are not taxed until withdrawal — at least according to current tax laws. But now members of Congress are looking to slash those tax breaks, effectively turning all traditional 401(k)’s into Roth 401(k)’s. That would mean you’d pay full taxes on any money going into your retirement account. Inversely, you wouldn’t be taxed as heavily on the money when you withdraw for retirement, but you’d lose a huge tax advantage by paying on any funds you deposit today. Essentially, this would be a new tax on saving, making it less incentivizing and advantageous for American workers to put away money for retirement. The Employee Benefit Research Institute already estimates workers between ages 35 and 64 are approximately $4 trillion behind on saving for a safe retirement. On top of that, another recent survey shows only 39% of Americans are confident in their ability to retire comfortably. If Congress decides to push these new measures through — and Americans are deterred from saving as a result — it could cause millions to fall painfully short of a secure retirement. U.S. lawmakers participate in one of the most secure and generous retirement plans in the world. They have access to both a traditional 401(k) and a taxpayer funded pension plan. They also pay a fraction of the average American in account management fees, and they receive a whopping 5% matching plan, dollar-for-dollar. Most Americans couldn’t dream of having such a cushy setup as U.S. representatives. Yet it’s those same politicians that are now eyeing average Americans’ retirement accounts as an easy target for new government revenue. So, is there a way to circumvent this possible money grab from Congress? If legislators start moving forward to slash current 401(k) tax benefits, Americans should be ready to protect their hard-earned nest egg. For those who can rollover their 401(k), one logical option is to move into a Precious Metals IRA. Unlike the money you put into your 401(k), the physical gold and silver that you can own through a self-directed IRA is much harder for the Federal government to manipulate. Plus, unlike the stocks or mutual funds that you likely have in your 401(k) today, precious metals carry permanent value that’s indisputable. If you’re ready to pull your retirement from the watching eyes of greedy government bureaucrats, this may be the time to move into gold.